Things you regularly do in your relationship are actually habits. These habits can impact your relationship in ways you didn’t expect. Habits are a lot like patterns. Once they’re established, they just sort of unfold themselves without much effort on your part. Until you make a deliberate effort to change them, of course. Furthermore, these daily habits serve as relationship rituals. Although you might not be entirely aware of them, they have the power to draw you and your partner closer together or push you apart. What Relationship Rituals Are Already Established? Take a minute to think of your relationship right now. You probably have habits or patterns that revolve around when you spend time together and what you do with each other. Developing positive relationship rituals is about making these things intentional. 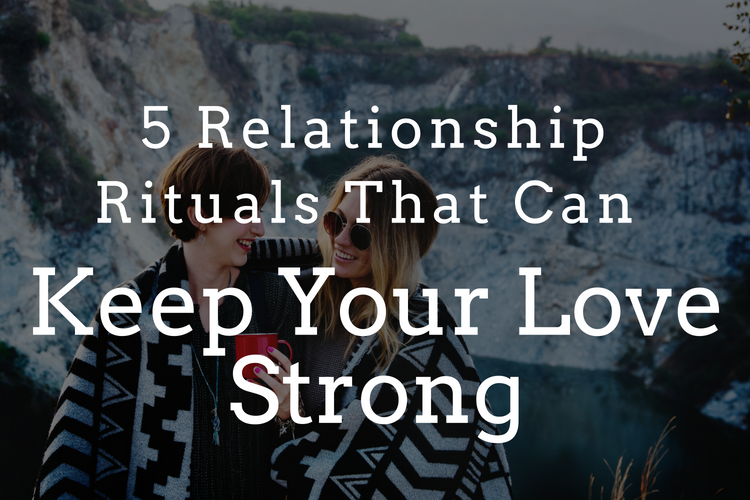 Rather than just falling into rituals that create distance and tension, it’s important to set them up so they best support you and your relationship. As you examine some of your current relationship rituals, take a closer look at some that may not be serving you well. For example, how do you greet each other when you come home? Do you stop your current activity to greet your partner or even look up from your phone when they enter the room? If not, then that particular ritual could be creating unintentional distance. Think about your mealtime or bedtime. Are you both glued to the TV or your phones? When you have a date night do you resort to the same restaurant or even order in and then plant yourself in front of a Netflix series? It’s important to identify the negative relationship rituals currently in place. Then, you can work to adjust them to better support your relationship. When you live with someone, your nervous system attunes to the other person. You co-regulate or deregulate each other. This means that small moments of connection, like physical touch or eye contact, can go a long way in creating and sustaining a healthy bond. Conversely, when you feel insecure in the bond to your significant other, you are more likely to argue or feel distant. Except for the dating ritual, all of the following are small things that you can begin to easily incorporate into your daily routine. These small changes, happening consistently over time, can lead to big change in your relationship. Couples that spend time together before going to bed at night, essentially putting each other to sleep, often report more harmony and connection. Think of the importance of bedtime rituals for young children. The pattern of a bath, a story, and wind down time is really important in settling their nervous systems so they can have a restful night. If you were raised with solid, consistent bedtime rituals as a child, it’s often much easier to take care of yourself in the transition to bedtime and sleep as an adult. This notion rings true for couples, as well. Especially, if you both have good role models or if one of you does and can set the tone for approaching bedtime. Even if you weren’t raised with these kinds of loving and consistent rituals, you can still create them together as a couple. More than anything, you can mold your bedtime routine to fit your lifestyle. For instance, the two of you might like to go to bed at different times. In this situation, it can be helpful to have the “night owl” partner put the other partner to bed, spending time quietly talking or cuddling. Demands of work and family life may not always make it possible to go to bed at the same time. But try to dedicate a few nights a week, even if it’s just on the weekends, where you have intentional bedtime together. A few ideas to try include: cuddling or hugging each other, looking into each other’s eyes, or reading to one another. You could also take a few moments together to talk about the things for which you are grateful or pray, if that is meaningful to you both. In these moments of devotion, express your appreciation for each other and for all you have in your life. This sincere time of togetherness often serves as a dynamic anchor for both you and your partner. After all, it’s easy to take things you do have for granted. This is especially true if you’re going through a hard time. It’s important to remember things like having a roof over your head, having love in your life, and being able to enjoy the sun or feel a fresh rain. Similar to the bedtime ritual, think of morning rituals as a way to launch your day together. It’s tempting to wake up and head full force into your daily responsibilities. For some, this means checking emails right off the bat or focusing on getting yourself ready for the day. Often, partners get left behind in this rush. It’s only natural to let the demands of work schedules, child care, exercise routines, or different sleep schedules dictate your morning routine. Still, if you can carve out a morning ritual as often as possible, it will help create a sense of security and connection as you start your day. Launching your day together not only supports a valuable sense of awareness, but it serves as a mood booster, as well. Relationship rituals don’t always have to be long and drawn out to make a positive impact. Your morning ritual could only take a few moments. What matters is that you share an intimate moment together where you kiss or hug each other or find a different way to connect. Every couple has its unique ebb and flow when it comes to intimate expression. So find one or more that fits your relationship and go with it. For instance, if time permits, try bringing your partner coffee or tea in bed or even make breakfast for them. It’s easy to get caught up in the rush of the morning and forget how impacting a positive ritual can truly be. A simple moment of connecting can go a long way in supporting overall relationship satisfaction. The way you leave your partner for the day or extended period can set the stage for the entire time spent apart. When one or both of you leave the house for the day, take a moment to hug each other and wish each other a smooth day. Much like your bedtime routine, look into your partner’s eyes and get physically close. Remind each other of appointments or special things on your to-do list. Let your partner know what to expect from you during the day, too. For instance, make them aware of when you will be available to check in during the day. This way if you are having a particularly busy day, they won’t feel hurt if you aren’t able to connect with them. It’s easy to get caught up in what you are doing when you are getting ready to leave home for the day – whether it’s dealing with the dog, kids, or juggling your coffee and your bags—you forget the power of a connected goodbye. But just a minute of connecting can go a long way. You’ll find that the effort will pay off. On a grander scale, if one of you is traveling and you can make it work in your schedule, drop them off at the airport instead of calling Lyft or Uber. Take a moment to hug tightly on the curb before you drive off. If you’re not able to do this, try and take an extra moment to attend to your partner if you are going to be separated for more than a workday. Much like your leaving ritual can set an emotional tone for you and your partner when you’re apart, your coming home ritual can have a similar effect when you come back together. Think about how you react when you come home to one another. Do you greet each other when one of you walks in the door? Do you acknowledge each other or give a distracted hello? Or do you keep yourself buried in whatever you’re doing—working on the computer, making dinner, tending to the kids, or other chores? For some couples, greeting each other may not be deliberate at all. You might simply wait to approach your partner when you happen to run into each other in the hallway. If you remain distracted by other activities when your partner comes home, it sends them the message that your distractions are more important than they are. Instead, pause what you’re doing and intentionally approach each other. Take a moment to make eye contact and hug each other. You’ll likely find that you immediately feel more connected. Though it’s a very human need to reconnect with those we love the most, it’s still surprising how these small daily rituals can contribute to decreased conflict. Separations and reunions are important! Even if you don’t think of leaving the house for work as a separation, it is on a small scale. And coming home is a small scale reunion, as well. The previous relationship rituals are all daily rituals—small ways to carve out time for one another that help to ease each other through transition times. A date ritual is a more concentrated time together that you do weekly or as your schedule allows. It’s time for just you and your partner to do something you both enjoy. Dating rituals can even be done at home. As long as you dedicate a few hours away from the phone, work, or other distractions, you don’t necessarily have to go to a restaurant or outside of your own home. Remember to pay attention to your level of connectivity during your date. For instance, if you go to the movies or watch TV together at home, find a way to purposefully connect. The movies and TV can make it tricky to nurture a genuine connection. Make it a point to hold hands and/or sit close to each other if possible. If you’re at home, turn to each other occasionally if something funny or surprising happens on TV so it can feel more like a shared experience. Even certain TV shows can be a connecting point if you approach them deliberately enough. You can try establishing a show as “your” show and discuss it as you cuddle together and watch it. Our brains pay attention to novelty, so try to stretch yourself to do new things together as a couple during your date ritual. *Need help establishing relationship rituals to keep your love strong? Call (415) 310-5142 to get started with therapy in San Francisco. We offer couples therapy in the Castro district of San Francisco.